A fiery volcanic eruption in south-central Guatemala sent lava flowing into rural communities, killing many as rescuers struggled to reach people where homes and roads were charred and blanketed with ash. 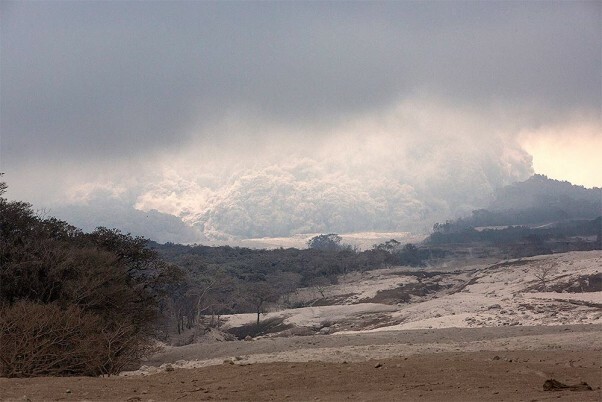 Clouds of ash rise from the Volcan de Fuego, or "Volcano of Fire," seen from the El Rodeo hamlet of Escuintla, Guatemala. 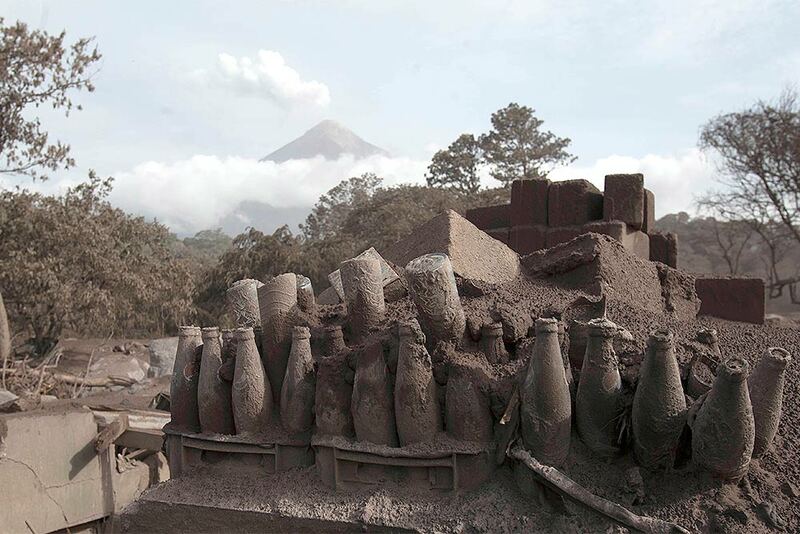 Crates of soda pop bottles stored on the rooftop of a home are blanketed with volcanic ash while the Volcan de Fuego, or "Volcano of Fire," blows out a plume of smoke and ash, in Escuintla, Guatemala. Rescuers were concerned about possible dangers posed not only by more volcanic flows but also rain. Authorities have said the window is closing on the chances of finding anyone else alive in the devastation. 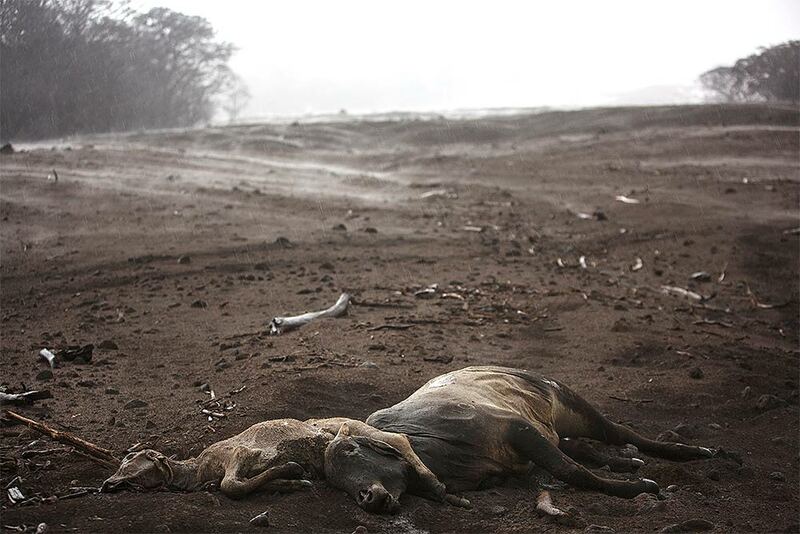 Cows lie dead amid steam rising from the hot volcanic ash following a light rain, near the Volcan de Fuego, in the El Rodeo hamlet of Escuintla, Guatemala. 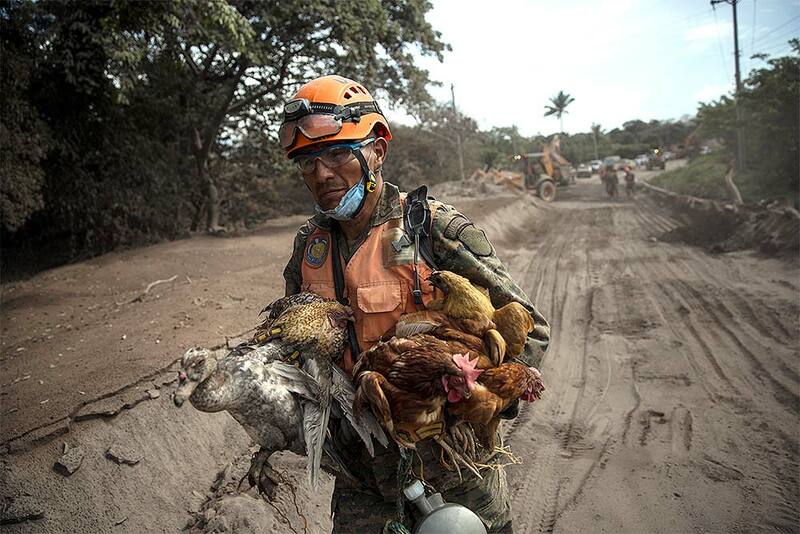 A rescue worker carries a flock of farm birds rescued from homes destroyed by the Volcan de Fuego eruption, in El Rodeo, Guatemala. 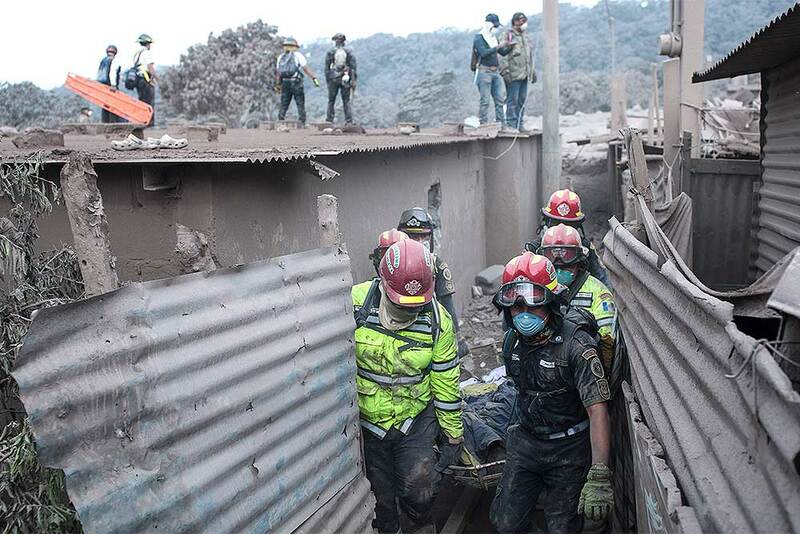 Volcan de Fuego, or "Volcano of Fire," releases a white plume of smoke as firefighters carry a stretcher during their rescue and recovery efforts in El Rodeo, Guatemala. 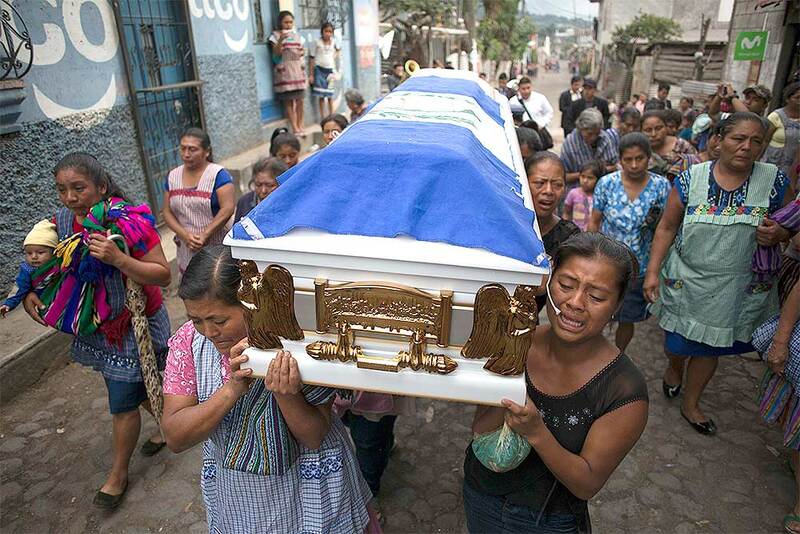 Female family members of Erick Rivas, 20, who died in the hospital after suffering burns from the eruption of the Volcan de Fuego, carry his remains to the Catholic church to bury him in San Juan Alotenango, Guatemala. 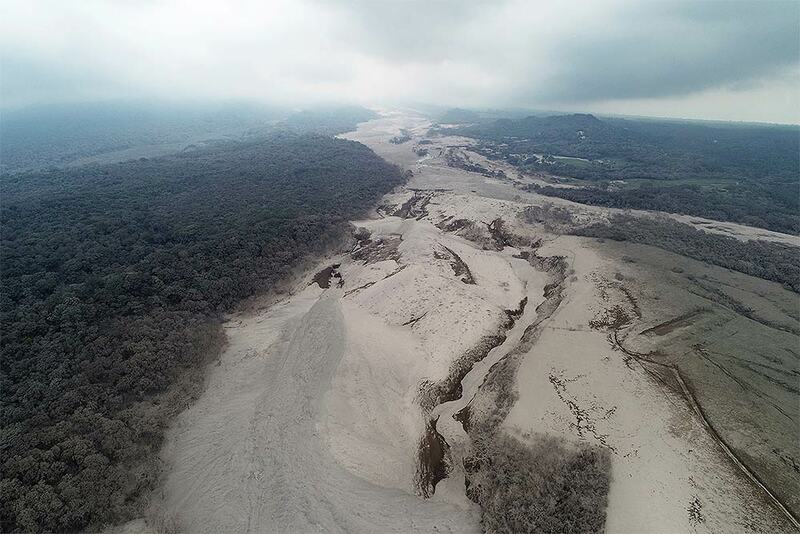 This aerial view shows the disaster zone near the Volcan de Fuego, or "Volcano of Fire," in Escuintla, Guatemala. 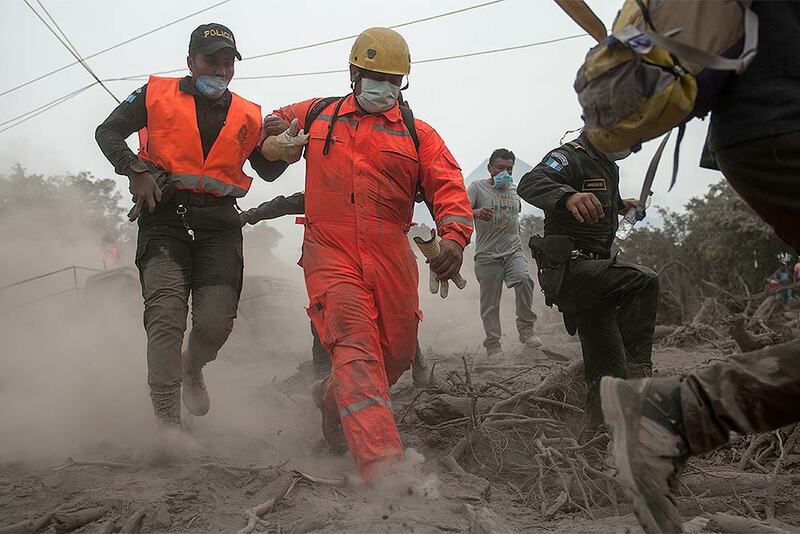 Rescue workers search in El Rodeo, one of the hamlets in the disaster area near the Volcan de Fuego, or "Volcano of Fire," in Escuintla, Guatemala. Rescue workers take a break amid volcanic ash blanketing the disaster zone near the Volcan de Fuego, or "Volcano of Fire," in the El Rodeo hamlet of Escuintla, Guatemala. 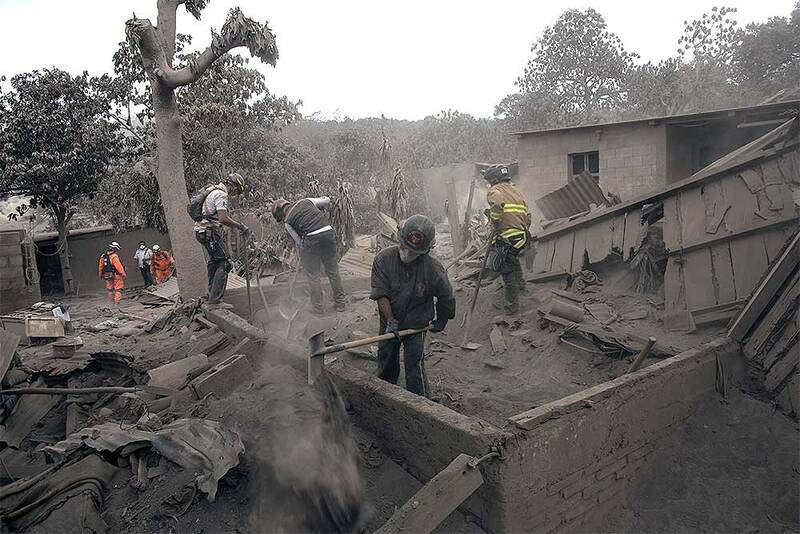 Firefighters work in the disaster zone blanketed in volcanic ash near the Volcan de Fuego, or "Volcano of Fire," in the El Rodeo hamlet of Escuintla, Guatemala. 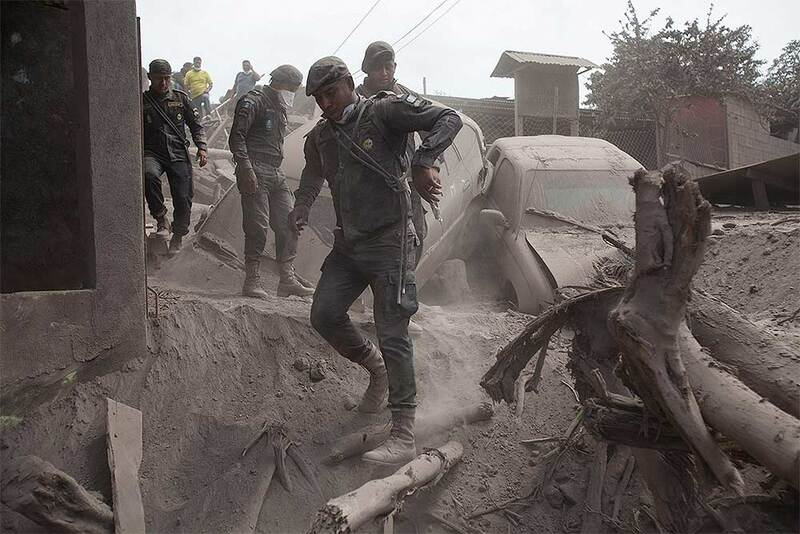 Police officers move in the disaster zone near the Volcan de Fuego, or "Volcano of Fire," in Escuintla, Guatemala. 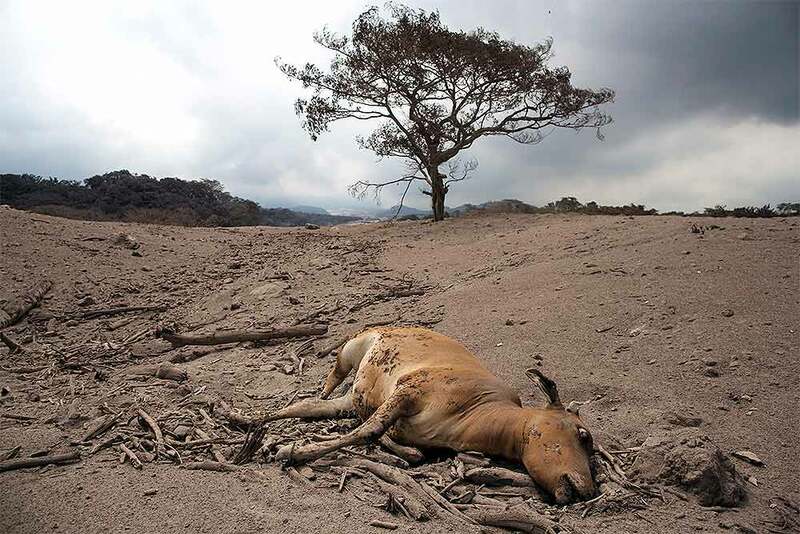 A dead cow lays in the disaster zone near the Volcan de Fuego, or "Volcano of Fire," in Escuintla, Guatemala. 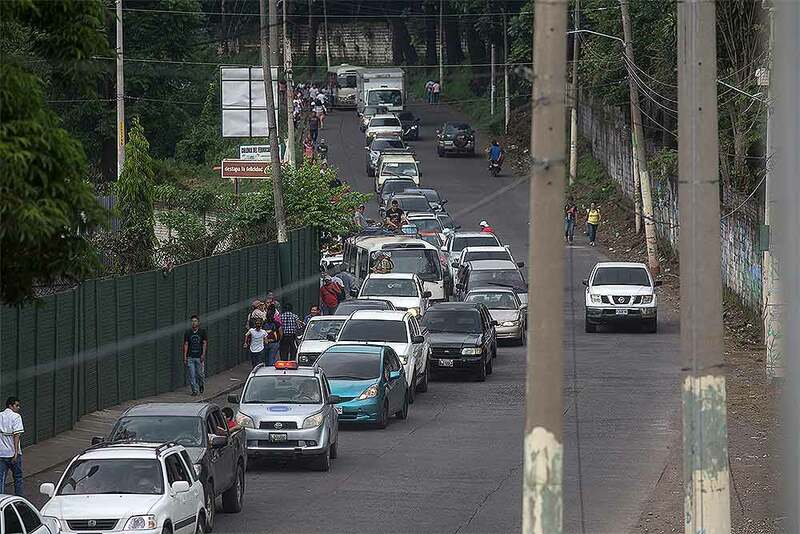 Residents evacuate after a new flow of searing hot volcanic material down the slopes of the Volcano of Fire in Escuintla, Guatemala. Volcan de Fuego, or "Volcano of Fire," blows outs a thick cloud of ash, as seen from Escuintla, Guatemala. 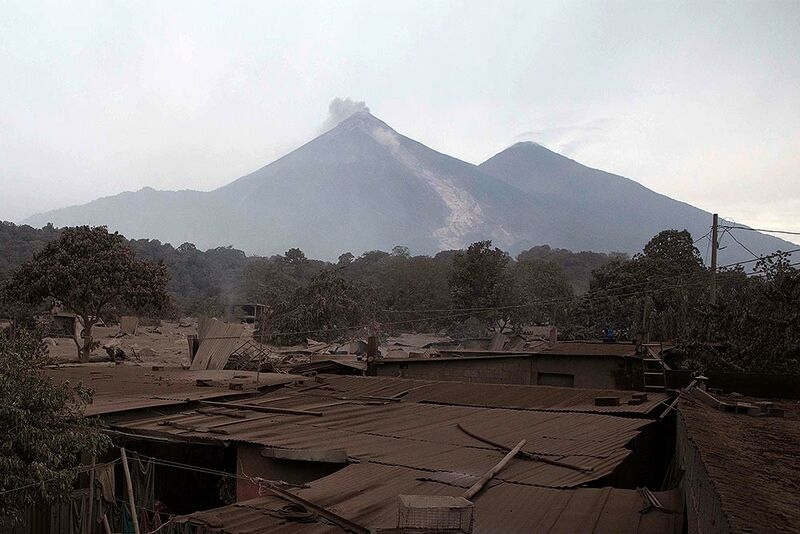 The Volcan de Fuego, or Volcano of Fire, continues to spill out smoke and ash as residents evacuate from Escuintla, Guatemala. 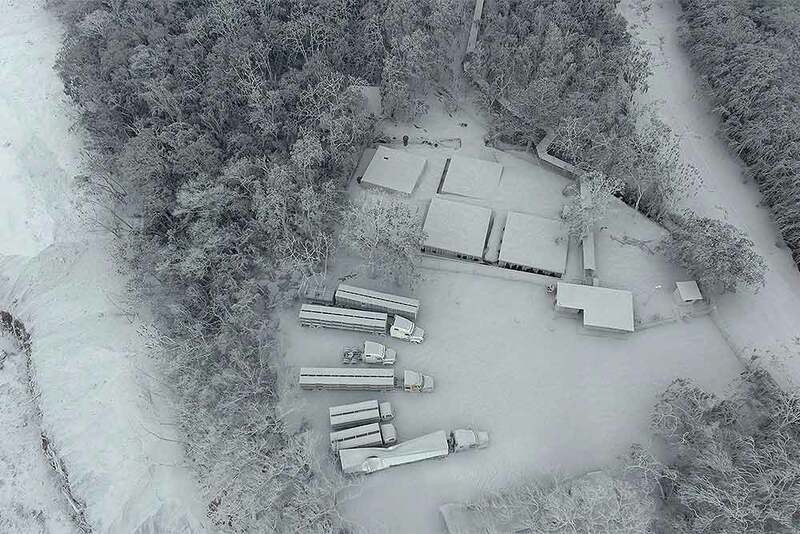 Firefighters and police are forced to evacuate a search and rescue effort as the Volcan de Fuego, or "Volcano of Fire," continues to spill out smoke and ash in Escuintla, Guatemala. 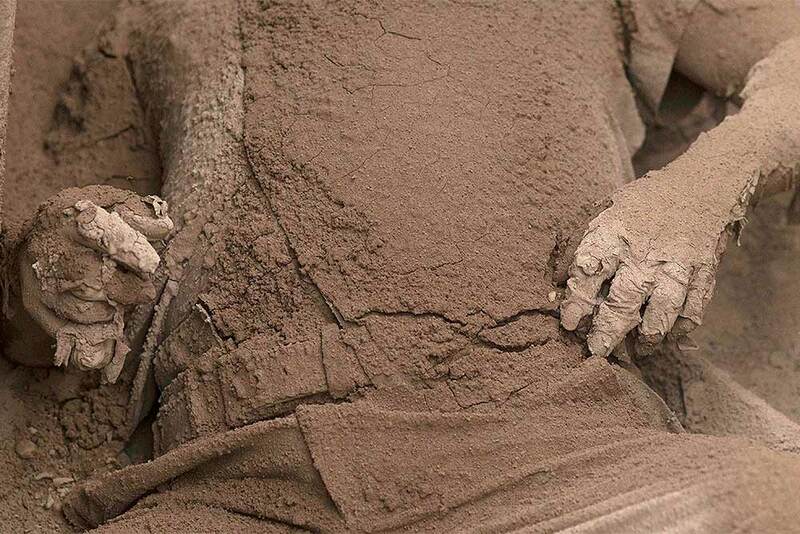 The body of a victim is covered in volcanic ash spewed by the Volcan de Fuego, or "Volcano of Fire," in Escuintla, Guatemala. 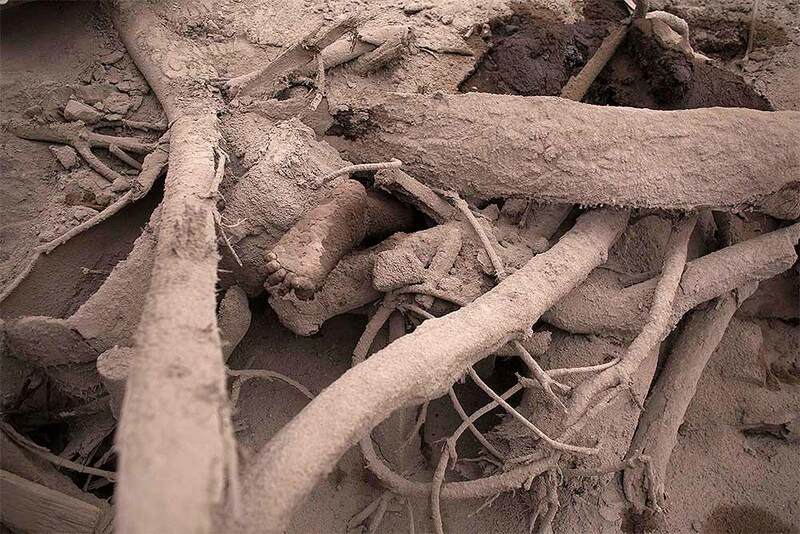 A body blanketed with heavy ash spewed by the Volcan de Fuego, or "Volcano of Fire," lies on the ground in Escuintla, Guatemala. 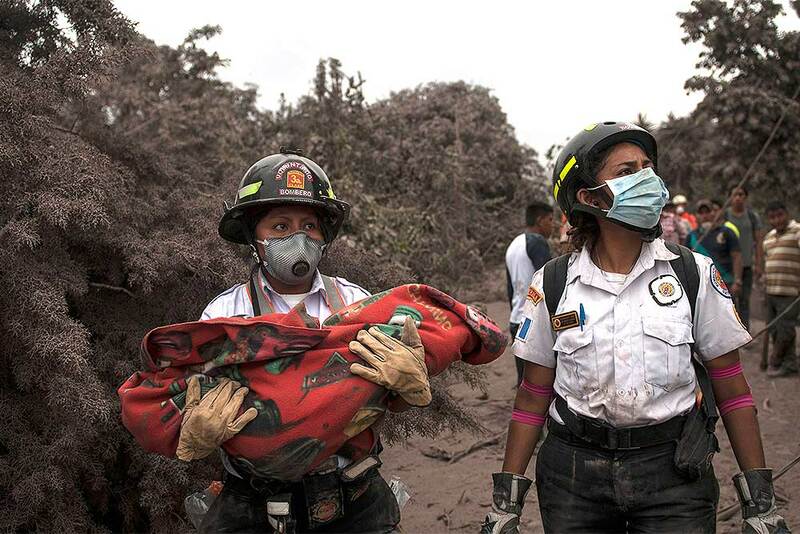 A firefighter carries the body of a child recovered near the Volcan de Fuego, in Escuintla, Guatemala. 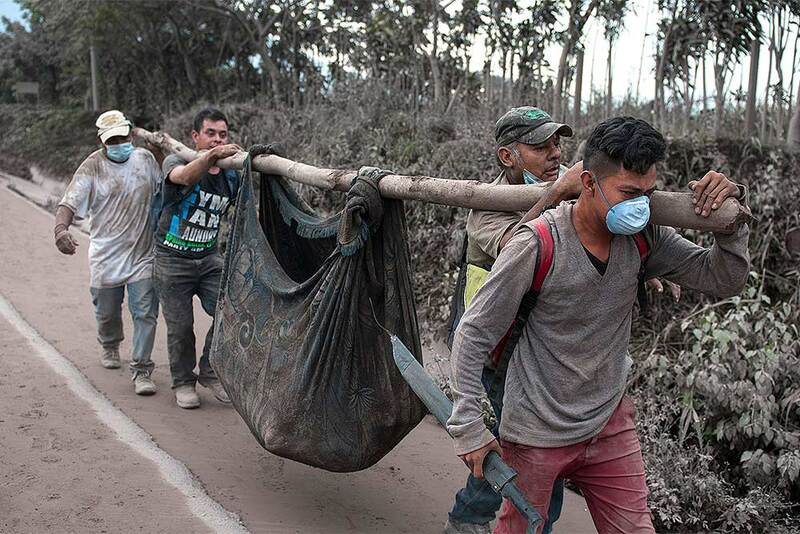 Residents carry a body recovered near the Volcan de Fuego, or "Volcano of Fire," in Escuintla, Guatemala. 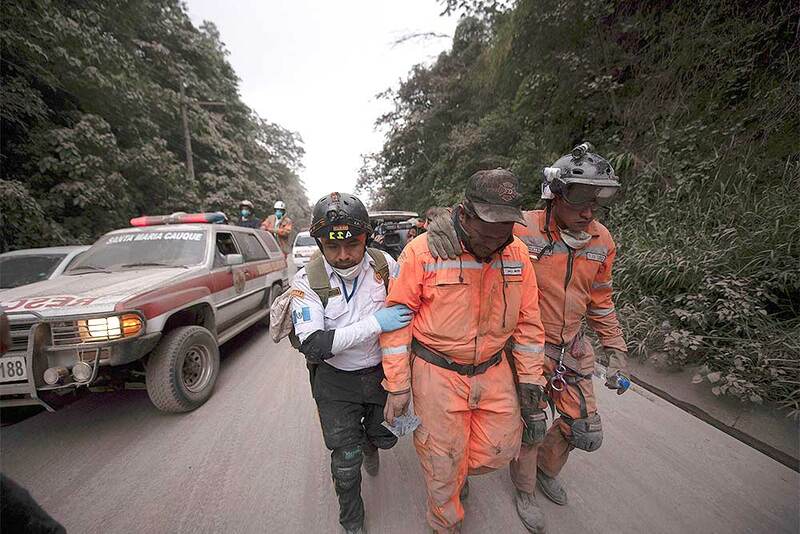 Firefighters remove a body recovered near the Volcan de Fuego in Escuintla, Guatemala. 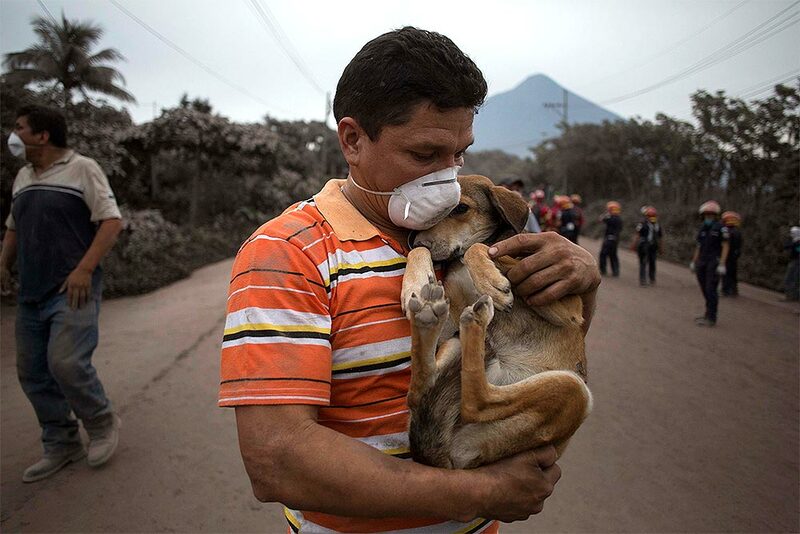 A resident cradles his dog after rescuing him near the Volcan de Fuego, in Escuintla, Guatemala. 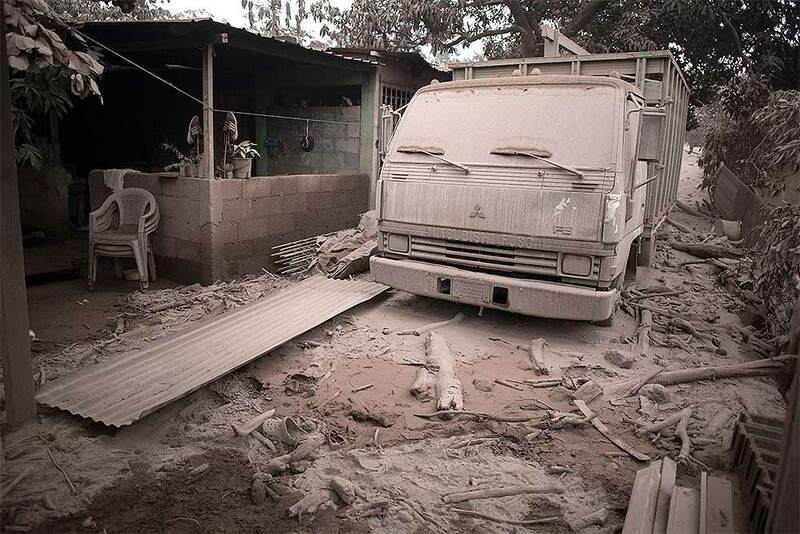 A truck is covered in volcanic ash spewed by Volcan de Fuego, in Escuintla, Guatemala. 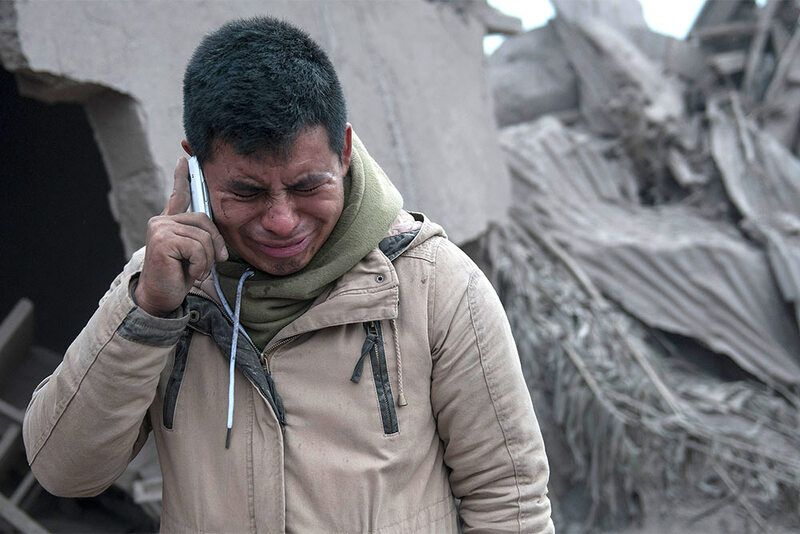 Boris Rodriguez, 24, who is searching for his wife, cries after seeing the condition of his neighborhood, destroyed by the erupting Volcan de Fuego, in Escuintla, Guatemala. 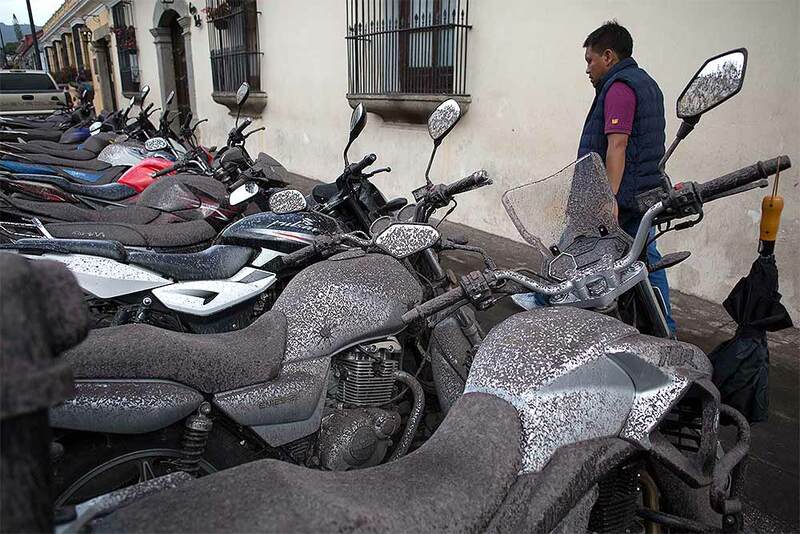 Volcanic ash covers parked motorcycles, brought by the Fuego Volcano, in Antigua Guatemala. 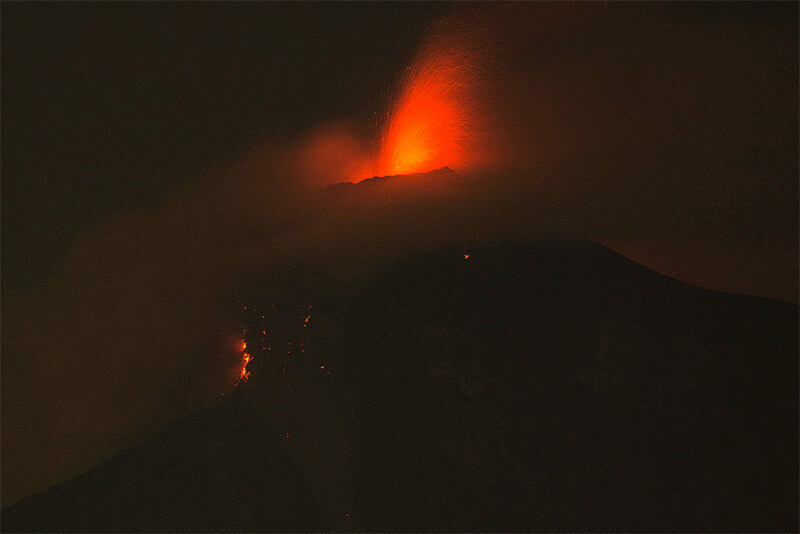 Volcan del Fuego is one of the most active volcanoes in Central America. 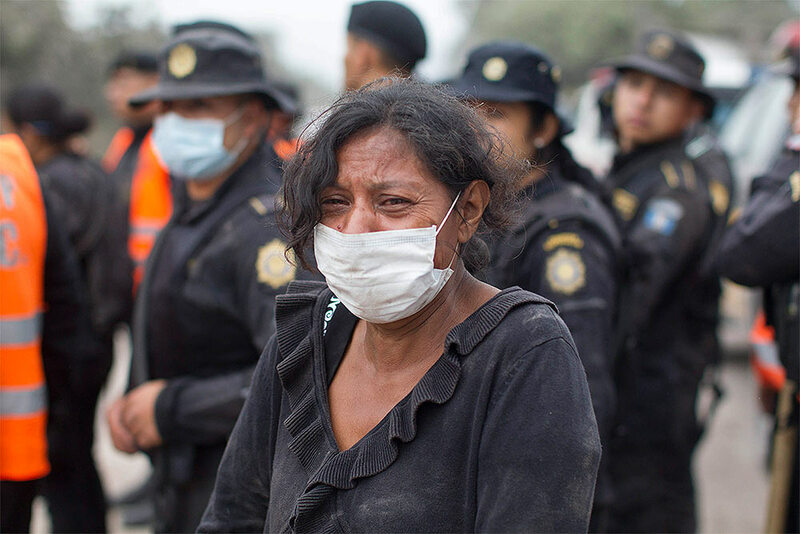 A resident cries after she was safely evacuated from her home near the Volcan de Fuego, in Escuintla, Guatemala. 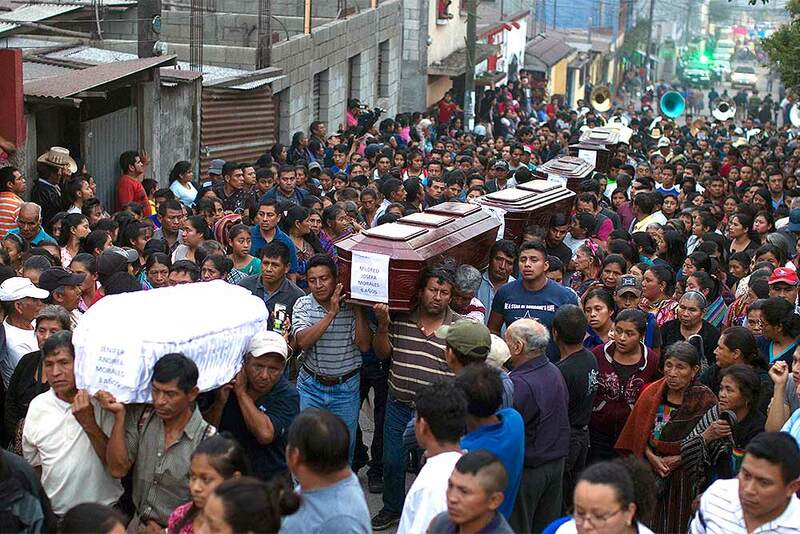 People carry the coffins of seven people to the cemetery who died during the eruption of the Volcan de Fuego in San Juan Alotenango, Guatemala. 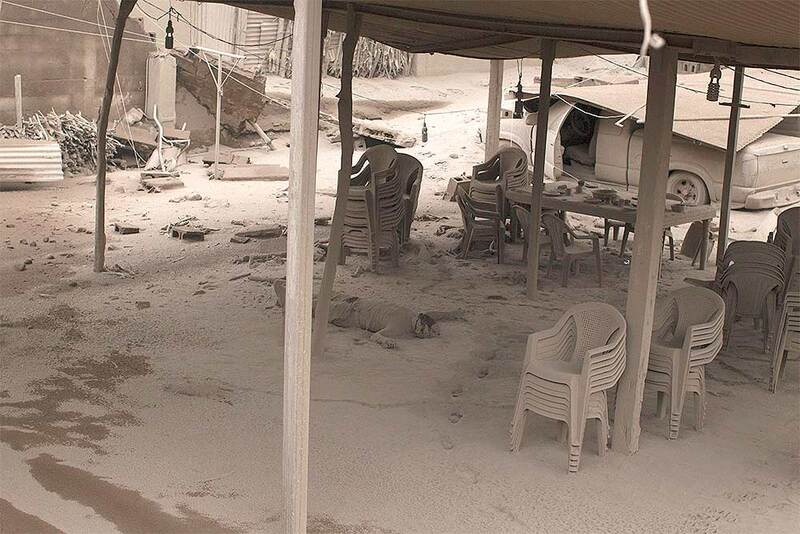 Residents of villages skirting the volcano began mourning the dead after an eruption buried them in searing ash and mud. 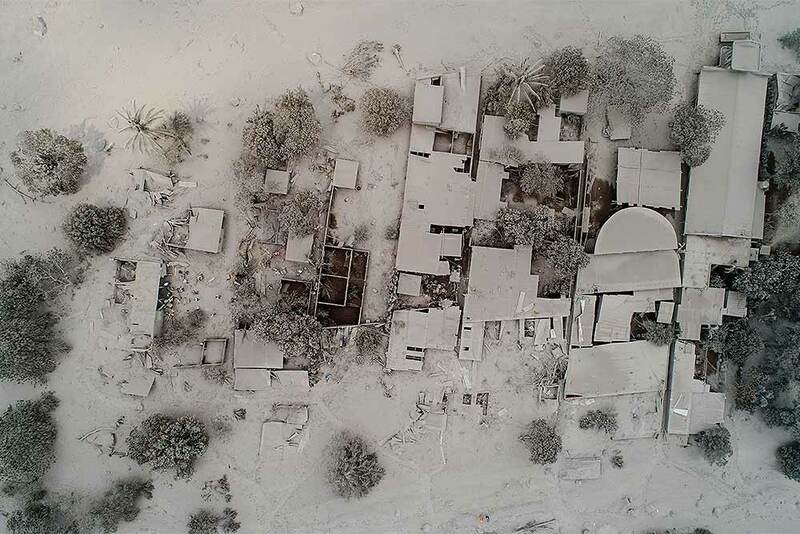 In this photo released by Guatemalan National Civil Police, shows an aerial view of the disaster zone, blanketed in volcanic ash after the eruption of the Volcan de Fuego, or "Volcano of Fire" in Escuintla, Guatemala. . 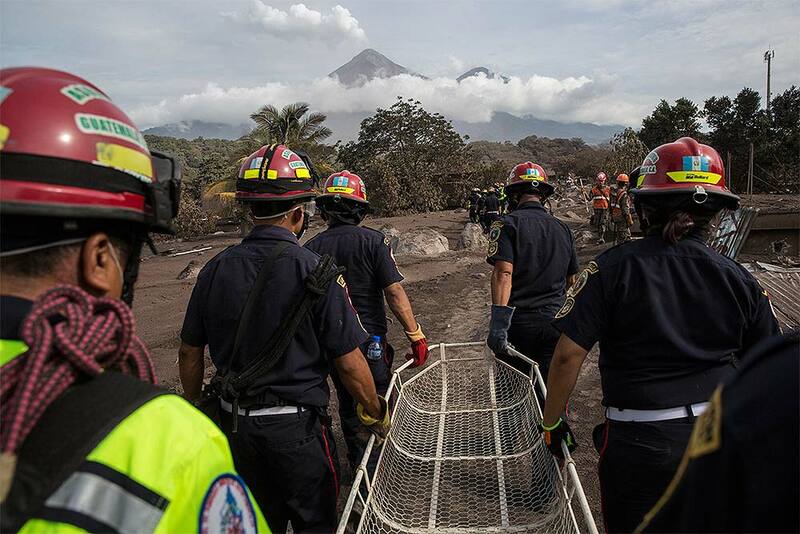 Firefighters leave the evacuation area near Volcan de Fuego, or Volcano of Fire, in El Rodeo, Guatemala. 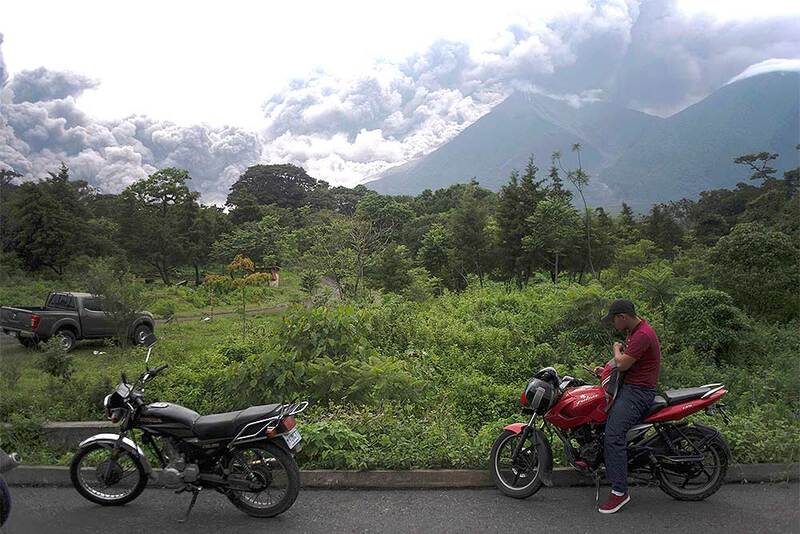 One of Central America's most active volcanos erupted in fiery explosions of ash and molten rock killing people and injuring many others while a towering cloud of smoke blanketed nearby villages in heavy ash. Volcan de Fuego, or Volcano of Fire, blows outs a thick cloud of ash, as seen from Alotenango, Guatemala. 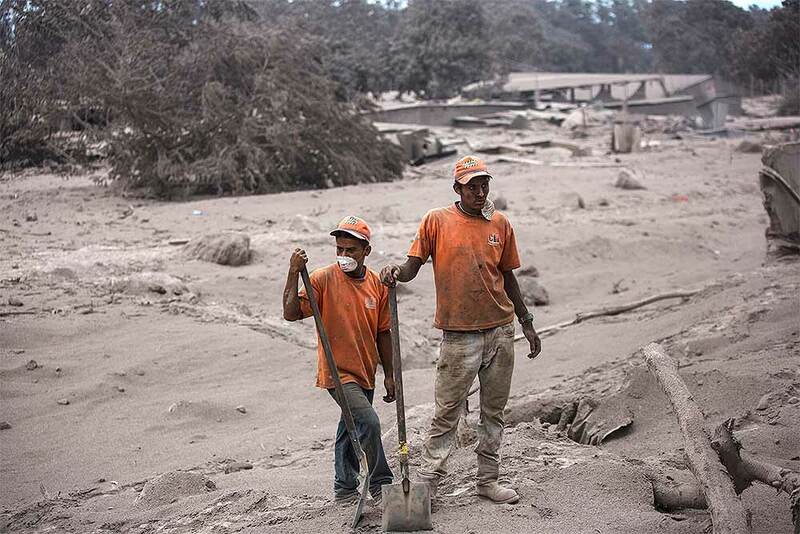 One of Central America's most active volcanos erupted in fiery explosions of ash and molten rock, killing people and injuring many others while a towering cloud of smoke blanketed nearby villages in heavy ash. In this image taken with a long exposure, the Volcan de Fuego, or Volcano of Fire, spews molten rock from its crater in Alotenango, Guatemala. 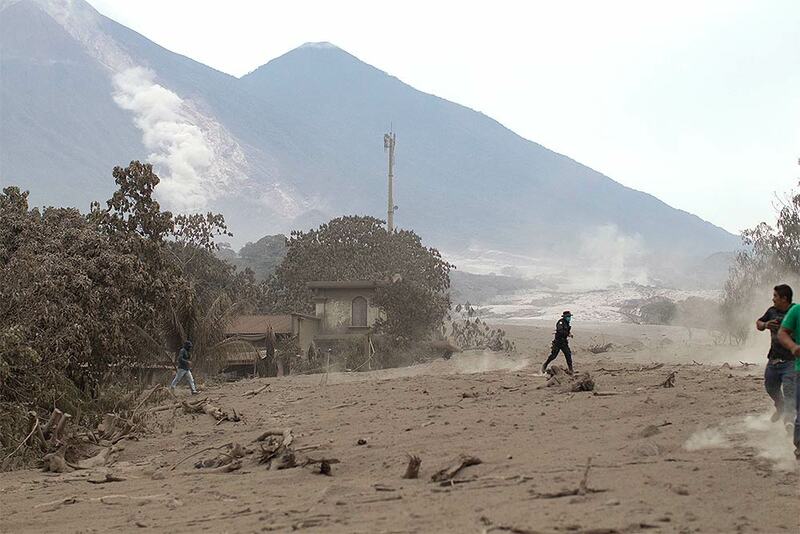 Rescuers struggled to reach rural residents cut off by the deadly volcanic eruption.